Marks/Label: Directions for Using Young's Improved Plaiter. Place the board with the lock end of the blades at the right hand. [Missing section]. For Making Side Plaiting. Place the end of the fabric at the end of the board nearest the body, being sure to have the Reverse side of the fabric up, and bring down and lock the first blade. Now pass the gauge (corresponding to the desired width of plait) under the fabric, and lock the next blade: with-draw the gauge and proceed as before. For Making Cluster Plaiting. Proceed as in side plaiting until the desired number of plaits are raised then bring down as many blades without using gauge, equal to space required between clusters. For Making Box Pleating; Single, Double and Treble. Begin as in side plaiting, using gauge to correspond to width of box; now bring down two or more blades, without using gauge, then raise another plait and press the two plaits towards each other; double and treble box plaiting in like manner. FOR WOOLEN FABRICS, cover with a damp cloth and press with a hot iron. Address all orders to ABEL WHEELER & CO., Manufacturers. BOX 59, LOWELL, MASS. 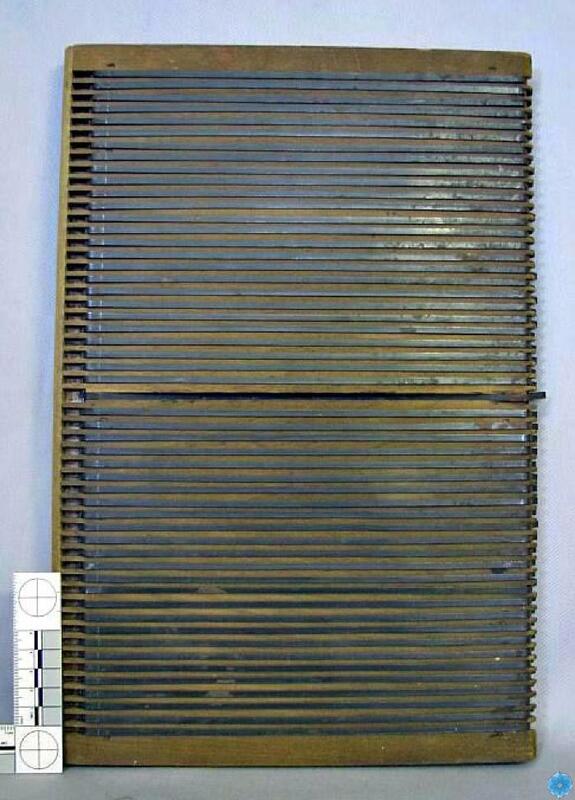 Description: Oblong board with fifty-three thin strips of metal running horizontally across. These strips are clipped on the side of the board. On the underside of the board there is a paper label providing a description of operation--see Marks/Labels field. History of Use: A device used by a seamstress to create pleats and decorative pintucks while sewing a garment.